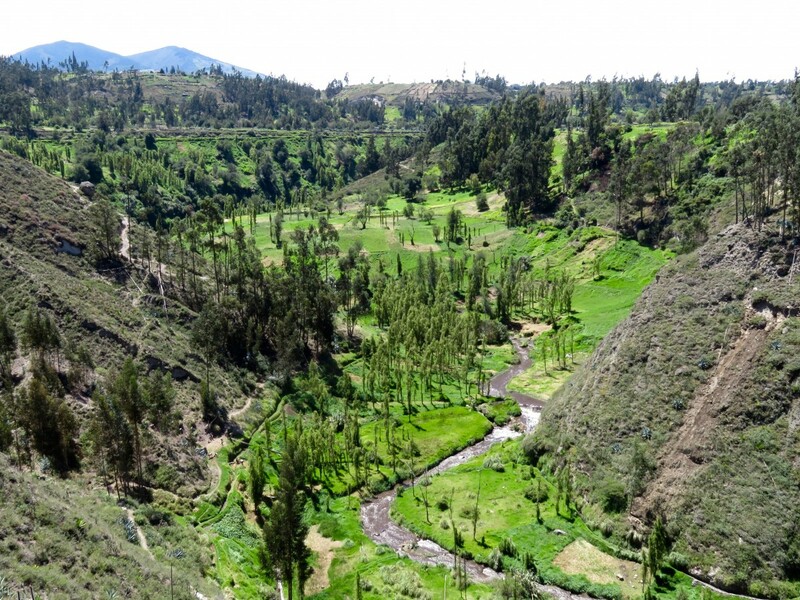 Taita Punta Rumi is a vast rock overhanging a steep mountainside, which has been sacred to the local indigenous Salasaka community probably for hundreds of years, since before the arrival of the Spanish in 1534, when it would have been called a wak'a (also huaca). Sometime in the 1930s, Christian missionaries arrived and carved crosses all over it, to try and negate its power, but I have to say this seems only to have enhanced its sense of numinous presence. Sometimes, around the midnight hour, a flame is seen arising from its summit by wayfarers, and the power it emanates is held to be fatal to infants under the age of three months. When I arrived at Taita Punta Rumi, all I had expected was that I would observe some traditional religious specialists – yachakuna – performing unspecified rituals there. I had been consulted earlier that day over whether I would be prepared to see a sacrifice (of a guinea pig), which I had assured my hosts I would be able to. But I arrived with little idea what to expect, more than this and a vague idea that there might be some ritual healing, involving the spraying of aguardiente on me. This I have experienced before (see Blog post 3) at the Cuenca indigenous market before Christmas. But that was that. So, when it finally dawned upon me that I was, in fact, to be the object of the ritual all by myself, I felt a little as a sacrificial victim might upon learning that they had been privileged to have been selected! No matter. It was all what I was there for, to be open to whatever opportunities to experience traditional indigenous rituals and therapies; as well as being able to introduce myself to the Salasaka communities and explain to them what my project was about. My healer Don Rubelio was apparently what is referred to as a ‘neophyte shaman’, which is to say he had relatively recently started to practice, as of five years or so ago. I had met him the previous day, together with an older and more experienced man - Don Pedro - from a neighbouring community, whose healing reputation was so formidable that people came from many miles around to consult him. It was interesting and reassuring to be able to observe the spontaneous continuity of a tradition that one might have feared would be dying out under the relentless pressure of modernisation. These healers are undoubtedly charismatic, and no less Don Rubelio, despite his relative newness to the profession. He laid out his ‘mesa’ – the ritual altar upon which his personal objects of power are set – under the rock and advised me upon the range of diagnostic and therapeutic ‘tools’ he might use, which included his personal stones, candles, magical herbs and aguardiente (locally known as ‘puntas’) which he carried in a large glass flask in hand. I thought it wise to go for whatever he thought best. The diagnosis is carried out principally through passing three unlit candles across the body surface and then lighting them and placing them in an alcove under the rock to observe the pattern of guttering and burning. They stand for the left and right side, and the heart, or centre (which is similar in some ways to Indian and East Asian Yoga understandings of the body). 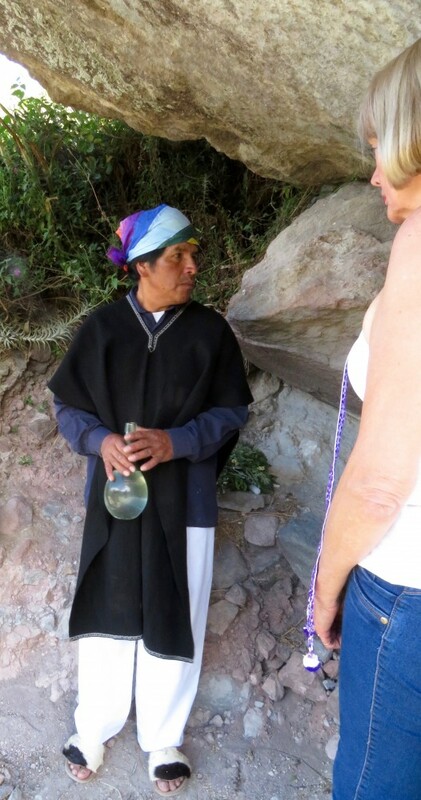 Several times he imbibed mouthfuls of aguardiente and ‘blew’ this from his mouth across the diverse objects to be used in diagnosis and healing, including the stones, herbs and of course, me. More impressively, he periodically blew the liquor through the candle flame (behind me, so I couldn’t see this) to the sound of an immense ‘whoomf’. Having read the candles and pronounced his diagnosis, he then proceeded to the full cleansing rituals which involved the same kind of herbal beating I had received in Cuenca before Christmas, and several more anointings with, and sips of, the aguardiente. He then repeated the diagnostic process with the lit candles and declared me duly cleansed and healed. There was something definitely elevating about the whole experience, which I feel quite disinclined to treat lightly or otherwise joke about. It felt more thorough and ‘powerful’ than the session at the Cuenca market, and not just because I had drunk aguardiente I have to say! I went away feeling strange, the analytic side of my mind working overtime with ideas and interpretations, the other side content to believe I really had experienced something very powerful and transformative. What the evidence-based clinical community would have to say about it is, of course, a different matter! But I have to feel that a randomized controlled trial of diagnosis and therapy using the methods (and as importantly, the location) of Don Rubelio, whilst perhaps scientifically justifiable, would altogether miss the magic of the moment. This blog entry was posted on Thursday 26th January 2017.